-Live Planted: Alyssa is such a good interviewer, warm and wise and interested in going deep on topics related to veganism and living sustainably; listening to the show feels like chatting with a new friend. Recent faves of mine include a chat about cooking techniques that minimize food waste and a zero-waste Q&A. I spoke with Alyssa on the podcast a few weeks ago about environmentalism and joy and trash jars and more, which you can listen to here if you’d like. -A Sustainable Mind: Sometimes I need help remembering that there’s a big environmental movement out there beyond zero waste. A Sustainable Mind’s host Marjorie Alexander talks to people working toward a sustainable world in so many ways, from farming to industrial design to corporate sustainability efforts. When I have some extra time, I’m looking forward to tuning in to this recent episode about climate adaptation. -Mothers of Invention: Mothers of Invention showcases female-driven solutions to climate change. (“Climate change is a man-made problem—with a feminist solution!”). Smart and funny Mary Robinson and Maeve Higgins talk to women around the world who are leading the fight for a stable climate. A place for finding new heroes, like Yvette Abrahams and Sarra Tekola. -Slow Home Podcast: Host Brooke McAlary isn’t interested in doing things other people’s way; good, because I’m not either. Listening to how her family has slowly downshifted to choose a life slower and richer and lighter on the planet leaves me encouraged and inspired. If you’re feeling frantic and looking for ideas for slowing your holidays—or regular days—start here. (Her Australian accent is a balm to the winter-bound, too). -Forever 35: Everyone’s favorite podcast just spoke with Natalie Harris of The Tiny Closet (listen here) about sustainable fashion, shopping less, and affording ethically made clothing. So often I think conversations about smaller closets and ethical fashion sound the same, but Natalie’s perspective was unique in many ways, and so fascinating. What else is on your list for listening? Very happy holidays to you and yours. -How to wrap presents, here, here, and here. -Get a jump start on your zero waste resolutions. (I'm still working on #7, as evidenced by this post). -How to stay zero waste on flights and long flights, here. You already know the drill: snacks and water bottles, folks. -Stock your car for a road trip. ("Vacation isn't the time to worry about being perfectly zero waste: I think it's a time to try to be generally zero waste, and to relax about the rest. But if you're loading up the car for a trip anyway, why not tuck in a few of the above items?"). -How to stay zero waste at a hotel. In one respect, at least. -Package-free travel snack ideas, whether or not you've got a bulk aisle at your disposal. -Zero waste city guides. (Escape the house and do something fun!). -Zero waste tea, three ways. -Take home a coffee or hot chocolate from your favorite spot. And, lastly, it's never more important than in this month of the year to give yourself grace and ditch the guilt when your best-laid plans to zero waste fall by the wayside. Traveling, being a guest in someone's home, gift-giving, parties: all can make it hard to stay zero waste. You try your best, you win some and lose some, you try again next year. That's my plan, at least. Do you have any tips for staying zero waste during the holidays to share? When wrapping a gift for a friend with an autumn birthday a few weeks back, I snapped some pictures of my method. I'm not on top of it enough to have wrapped holiday gifts yet - but when I do, this is close to how I'll be approaching it. 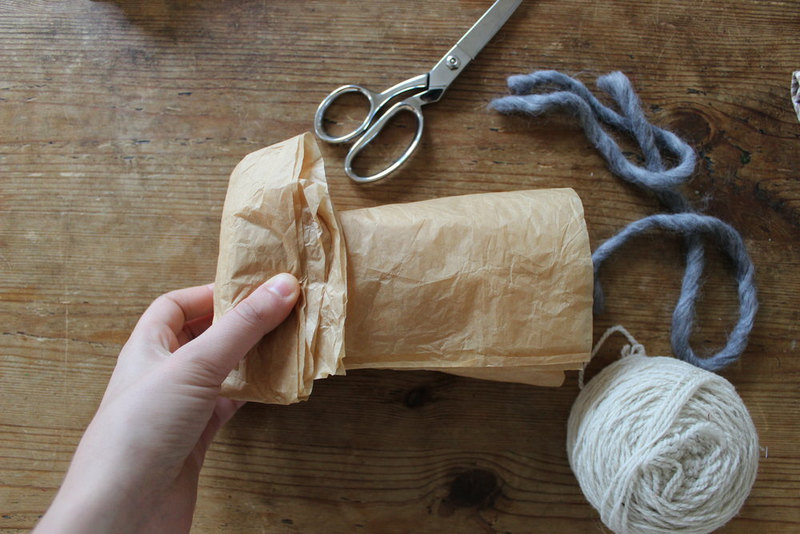 The most zero waste gift wrap, of course, is no gift wrap. But I've found the more that zero waste looks like austerity, the more I push back against it, unwilling to give up some of the things make my life a bit brighter and better. (Gift wrap, mascara, soba noodles. Etc.). Since my goal is changing habits for the long term, not making frantic overhauls that won't last, I've found the space in my zero waste routines to wear mascara, eat plastic-packaged soba noodles, and wrap gifts, and I'm the happier for it. Step 1: Gather supplies, with an eye toward the reused, the reusable, and the compostable. For me, this process starts much earlier in the year: I keep a box in my closet that's full of papers and supplies that come my way that feel ripe for reusing. The paper shown here was saved from a special purchase at Elizabeth Suzann earlier this summer, tucked away because it was too good to just recycle. I also save the plain brown kraft paper that often comes with online purchases, which can be dressed up with drawings or a special ribbon or even left as is. Other ideas for reused paper that can be turned into wrappings: the pretty catalog you find in your mailbox (before you email the company to get off their mailing list), newspapers (please not any section featuring our orange-in-chief, so depressing), or gift wrapped saved from another special occasion earlier in the year. Other supplies you might want: compostable paper washi tape, and then some ribbons or twine as the final touch. For that last part, I go with natural twine (compostable! ), or otherwise, ribbons I've saved over the years from gifts given to me. Step 2: Wrap the thing! Easy. If you don't have washi tape, you can also wrap gifts without any tape by being inventive with how you tie your twine or ribbons. Here's a little primer on that method, which I used last year. Step 3: Make sure the recipient knows how to recycle the materials, if you think you can slip this information in without being preachy and irritating. An excited "And the tape is compostable!" or a "Here, let me recycle that" might do the trick. Taking charge of cleaning up the gift wrap on a holiday evening or morning is a good way to ensure that you can sort and save things properly, rather than letting a relative or host sweep everything pell-mell into a garbage bag. Of course, this is just one way to wrap gifts, the way that aligns most closely with traditional gift wrapping. There are many other ways to do it, and using your inventive little mind is most of the fun. I've wrapped gifts in tea towels, reusable tote bags, bento bags, reused tissue paper, reused gift bags, furoshiki cloths, reusable cotton bulk bags. (You can find my favorites of those items linked here, in case you're in the market). For more ideas on how to wrap gifts zero waste style, take a peek at last year's posts on the subject, here and here. Anyone else still staunchly clinging to gift wrapping? Favorite tricks to share? Previously in Zero Waste: The simplest zero waste travel tip out there, and a guide to the items I use day in, day out. Happy Valentine's Day to you all! I'm so grateful to you for reading and commenting and following along, for writing your own blogs, emailing me with questions and tips, and just being here. Thank you, guys. I like to celebrate with a meal at home with my partner (last year: homemade veggie burgers and sweet potato fries) and by sending copious e-valentines to my gal pals. (A few I love for this year: this, this, and this). -Something for self care. Bath salts bought in bulk at Whole Foods, a jar of bulk tea, a healthy homemade treat, a plant to brighten up their bedroom, a beeswax candle. -A donation in his or her name. To the ACLU, 350.org, Planned Parenthood, whatever floats his or her boat. Nothing sweeter these days, I don't think. -Some pre-stamped blank postcards they can write to their congresspeople, if like me, your valentine has been texting you daily with mild to severe political freakouts. -A commitment to love others just as much as you love him/her. (Goes great with the postcard gift above). Can be expressed by going to a protest, calling your congresspeople to ask them to stand for equal rights for all, showing up at a local town hall meeting, volunteering in your community, etc. etc. etc. forever and ever. -A Spotify playlist made just for them, with all your favorite mushy songs. (Like this one). Last year I shared a few more zero waste Valentine's Day ideas, too - see them here, if you'd like. Hope you have a good one, friends. Wishing you all the love and peace and happiness in the world. Gift wrapping with an eye toward sustainability goes down much like anything else in the realm of zero waste – use a heaping dose of common sense, restraint, and recycled / compostable materials. :) I like the challenge of making beautiful packages from castoff materials, and the added bonus is that they tend fit my design sensibility better than conventional gift wrap, too. Above are some of the materials I gathered together this weekend to start wrapping a few gifts. The soap and reusable cotton rounds were my contribution to the gift exchange at a zero waste holiday party I hosted this weekend. To wrap them, I gathered up a few reused and upcycled materials from around the house. Tissue paper that I'd saved from a past purchase, wool yarn scraps from knitting projects, and a few sprigs of eucalyptus. The tissue paper and longer strands of yarn can be reused, while the rest can be composted. Although I have a stash of old ribbons that I sometimes use when wrapping gifts, I've come to prefer using yarn because I think it looks cozy and lovely, and because it can be composted if it's made entirely of natural fibers. Score. I've been trying to move away from using tape, which is plastic and not recyclable. (But so convenient, no?). My way around it has been to leave the sides of the paper extra long, so that when folded in they can be tied with string and still stay securely. After I'd tightened the first layer of yarn that held the package together in lieu of tape, I decorated it with some extra scrap yarn and the eucalyptus. Done! There are so many variations you can make on this simple theme. Use reused brown paper, old newsprint, or even catalog pages in place of the tissue paper. Reused twine, ribbons, or baker's twine can replace the yarn if you don't have any on hand. For decoration, I gravitate toward eucalyptus, pine, holly (but careful, it's prickly! ), or even branches or twigs - anything that seems cheery and seasonal and can be foraged or purchased sans plastic. I also like the idea of wrapping your gift in something that can be reused, which can sometimes be a nice additional gift itself. Below, I used a cloth bento bag to wrap a gift, which couldn't be easier - just tie the ends and you're done! You could also tie your gift up in a new handkerchief, cloth napkin, tea towel, furoshiki, or cotton bulk bag, or place it in a glass jar; these are all things the recipient can use again and again. I'd love to hear how you approach low-waste gift giving and wrapping. And, if you share any photographs of your wrapped gifts on Instagram, tag me in the comments so I can see them! Happy almost holidays, friends. To state the obvious: I care about the planet and overconsumption. But, I also think that giving small and simple gifts is a really sweet part of this season. I don't think these two tenets are incompatible; to reconcile them we just need to step back and re-think what gifts are intended to do. I love the idea that gifts don't have to make someone's whole year - they just have to make them smile. It's a good rule of thumb that lets us reign in the standard holiday madness without losing the tradition of exchanging thoughtful things. I don't need to give or receive anything huge, just smaller bursts of cheer to share with family and friends. The gifts I give tend toward the handmade and homemade, the edible, and the useful. (Or, for friends upon whom this won't be an imposition - maybe a few pieces of zero-waste-inspired gear to help get them going, like the Kleen Kanteen that I gave my boyfriend last year to fuel his coffee habit in a sustainable way). There are many more wonderful ideas for giving sustainably around the web, and I wanted to point you toward a few of my favorite posts elsewhere, in case browsing gift guides is for you, like me, a major guilty pleasure this time of year. Edible gifts, always a favorite. Zero waste gifts for faraway friends. Ideas for charities that could really use your help (Or, let your friend pick the charity you'll donate to as a gift! A close friend of mine recently did that for me and it meant so much). A list of experiences you can give in lieu of objects. And, experience gift cards - a beautiful way to give non-object gifts. Ideas on giving less, but giving more. Ideas for last minute gifts, from me last year and from elsewhere. Trash-free gifts for hostesses, travelers, and pet owners. And everyone in between. And, a few more tangible gift ideas for the zero wasters in your life: jars of bulk foods they love, homemade lotion or lip balm, some tea or chocolates bought in bulk, unpackaged bars of soap, beautiful cloth napkins for the table, homemade jam, a homecooked meal, hand-sewn (or storebought) handkerchiefs - I find you can never have too many, a few extra cotton bulk bags, a furoshiki cloth for endless use, DIY dryer balls, a batch of your signature granola packaged in a glass jar, a spork or straws to tuck in their bag (PS - you can currently find stainless steel straws without packaging at West Elm stores), or something bought just once a lifetime. My mom knit me the scarf above for my birthday this year - I love it so much. Besides not purchasing it at all, acquiring something secondhand is typically the most sustainable way to source something. But, sometimes this isn't feasible - you can't find what you need secondhand, or maybe you don't want to give a secondhand gift. When I purchase something new, I try to find a version that looks hard-wearing enough that I can have it for years and years. I bet you probably do, too. Have you heard of the awesome online store Buy Me Once? The owner corrals the most long-lasting products she can find. Maybe a brand is known for being super durable, or having the a lifetime guarantee or a stellar repair policy. I love that idea. I haven't purchased anything from the store, but I often turn to it when I'm trying to research which umbrella / hairbrush / teakettle might last me the longest. It's so fun to browse and check out the reasons that each item was chosen for inclusion. The concept of "buy me once" can extend beyond that store, too. I love the idea of giving a gift that your user will keep more or less forever and never have to purchase again. For my birthday this year I received the enameled cast iron pot photographed above, and I'm so looking forward to cooking with it for decades to come (my mom has been using hers for twenty years!). If you go this route, you can include a little note explaining how to care for the object. Gifts with good longevity needn't be expensive, necessarily - see the suggestions below for ideas at different prices. This post isn't sponsored - I just aspire to have more things in my life that are bought once and never again, and think their site is such a great resource.